for a randomly-selected major US city, in order to attend the annual migration of archaeologists represented by the Society for American Archaeology meetings. This year the meetings are in Albuquerque, New Mexico, and I am writing this from a bar at LAX after a 4:40 am taxi, 2.5 hour bus ride, and 11 hour flight from Heathrow. I am in better shape than I anticipated, in large part because I abandoned any pretence of working on the plane and instead treated myself to watching all of the Oscar contenders/various thrillers/Marvel blockbusters I have somehow did not seen in 2018 (in order: A Simple Favor, 8th Grade, Venom, and A Star is Born). 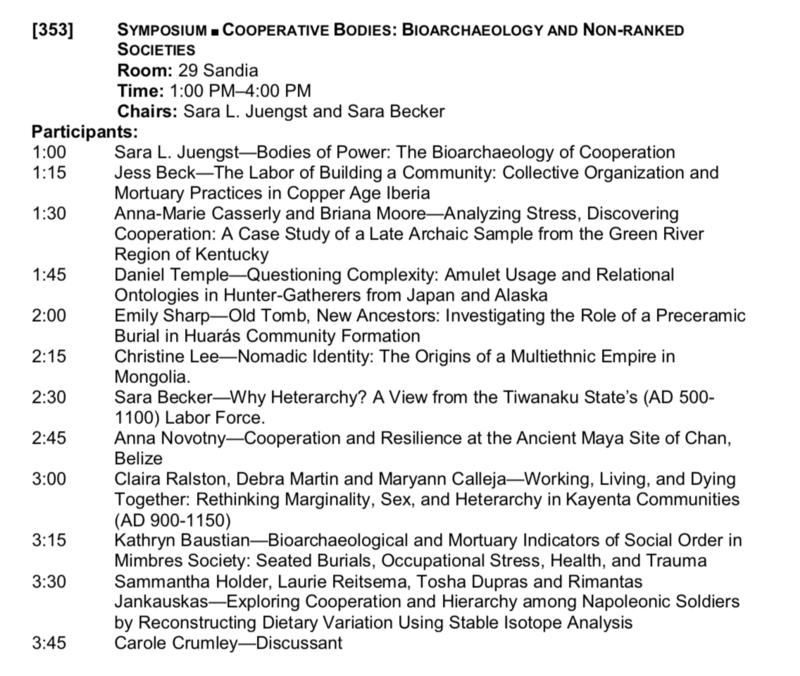 The session looks to be an excellent assembly of colleagues working on issues of identity, community, adaptation, and landscape within the fields of mortuary archaeology and bioarchaeology. Our session is no˚ 183, and takes place this Friday, April 12 from 8:00-11:00 AM in the room 15 Zuni. 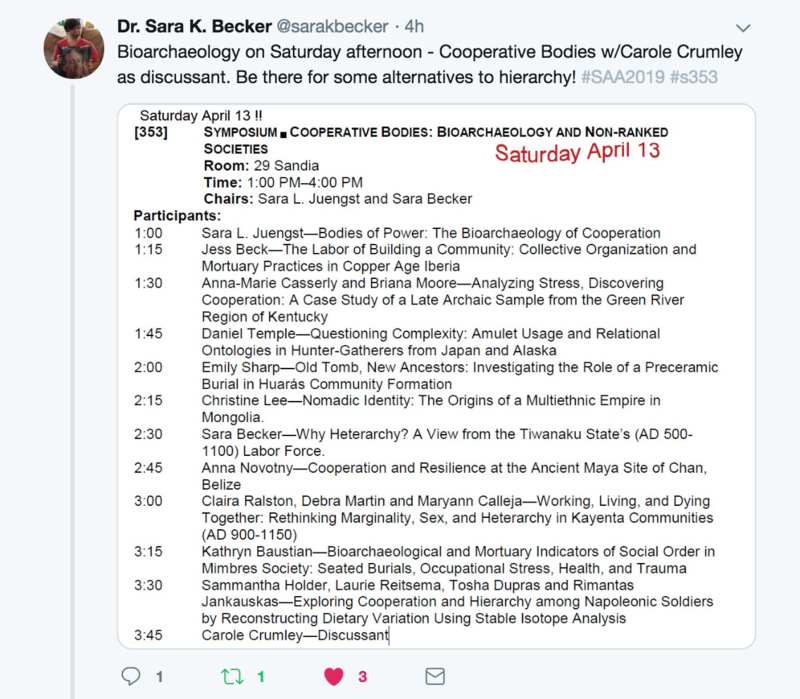 Because I am incapable of pacing myself (and also because I assumed that EAA and SAA participation rules were the same – INCORRECT), I am also presenting in a great session co-organized by the Saras2—Sara Becker and Sara Juengst. Their session  takes place on Saturday from 1300-1600 in 29 Sandia. If we are friends, colleagues, friendly colleagues, or nemeses*, please swing by to hear these talks, which I am very much looking forward to, despite the likely absence of alien somatic symbiosis in any featured presentations. 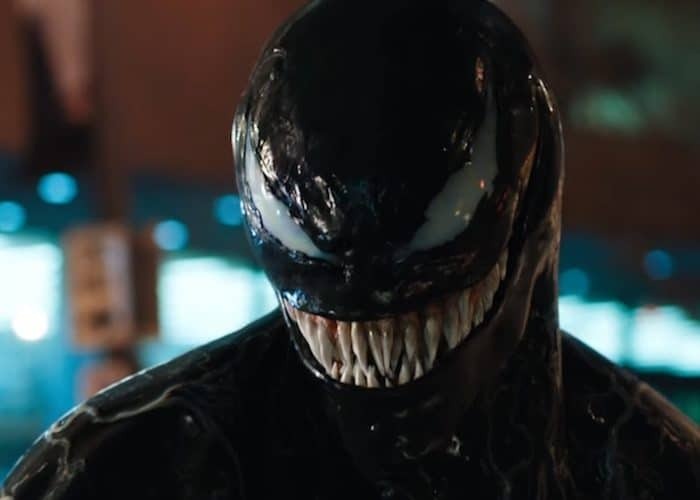 If it adds incentive, I can also enthusiastically explain the plot of the movie Venom after either session. 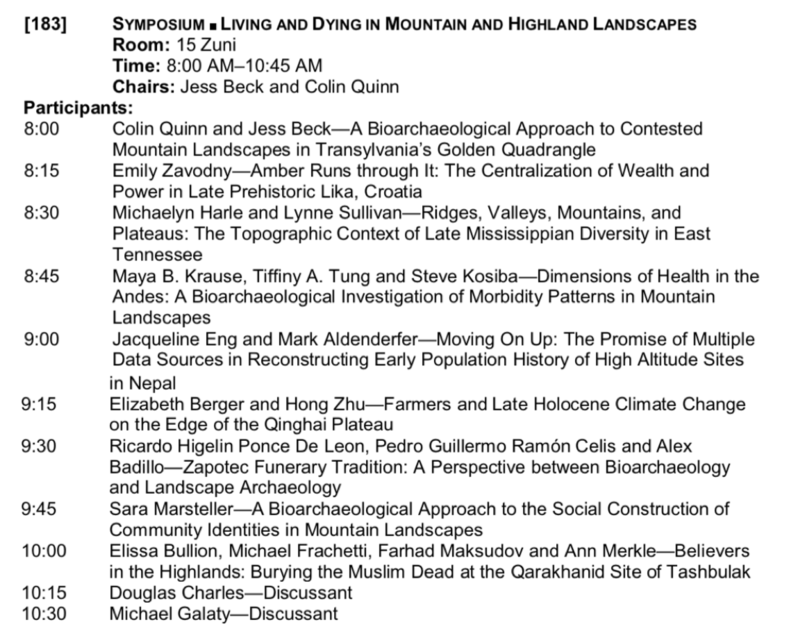 *Or, I suppose, in the unlikely event that you fall into none of those categories but are interested in the bioarchaeology and mortuary archaeology of either mountains or non-ranked societies, come to the talks and then define your social/professional relationship to me after the fact. Image Credits: Venom smile from Film School Rejects, here. I have been absent from the blog for several months because I’ve been working with my friend and collaborator Colin Quinn to prepare our first season of excavation in Alba County, Romania as part of the ongoing Mortuary Archaeology of the Râmeț Bronze Age Landscape project. This has entailed a number of exciting steps. Coordinating shuttle trips from Budapest to Cluj-Napoca! Ordering 500 Whirl-Pak geological sample bags! Filling out 15 pages of risk assessment forms for my home institution! Making a trip to the Dedeman hardware store in Alba Iulia every two days! 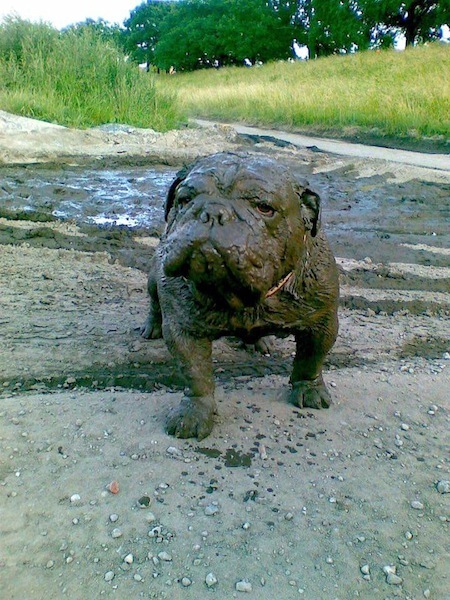 What can I say – my life as a professional archaeologist is infinitely glamorous. This is the fanciest thing I have ever done in the field. We are here with three Hamilton College undergraduates, and have been trying to show them that there is more to Transylvania than 2x2m archaeological units. Last Saturday two local colleagues, Liviu Balăn and Raluca Burlacu, offered to take us on a trip to the neighboring Ampoi Valley, about a fifteen minute drive from Alba Iulia. We set out on a hike on the morning of June 16 to visit multiple archaeological sites strung out along the course of a mountain ridge line, including the “Castru Romana Ighiu” (Roman Fort at Ighiu), and an Early Bronze Age necropolis at Ampoița. Parking down in town, the first major landmark visible on our trip was the Calcarele de la Ampoița, a massive limestone formation. These formations are often markers of Late Prehistoric sites in the region. This is a view from the tail end of the hike. A local shepherd, his flock, and his crew of extremely suspicious canine companions. Turning to the east/northeast, we could see the steep, rounded hilltop that housed the remains of the Roman fortress, along with the town of Șard spread out below. The large hill in the foreground on the left is the hill home to the Roman fort. The town of Șard visible to the right, and the distant hill in between the fort and the town is called Bilag. As we toiled upwards, the defensive advantages of the hilltop became increasingly obvious. The students, laboring up the hill. After taking a few minutes to recover, I learned a variety of important things. First, these salty pretzels with brânză (sheep’s milk cheese), provide a delicious means of controlling your salt balance and staving off dehydration. Second, after much badgering of both Liviu and Colin (“which one is Piatra Craivii again?”) the unparalleled view from the hilltop provided an excellent locale for mastering local toponyms and topography. As we lounged about vacuuming down cookies (as a direct result of archaeological fieldwork we are all now accustomed to a mid-morning sugar hit) and covrigei cu brânză, Liviu gave us some historical context for the site we were standing on. The fortress is located across the Ighiu Valley from Piatra Craivii, a triangular peak which housed a Dacian fortress. The Romans, wanting to keep an eye on their pesky mountain neighbours, who had proved somewhat resistant to incorporation into the imperial sphere, set up shop directly across the valley. Liviu explained the fraught relationship between the Dacians and Romans, covering periods of war, periods of peace, and the rise of Trajan, the Roman emperor who finally conquered the area, largely drawn here by the region’s copious supplies of gold. In Rome, Trajan’s Column recounts the history of the Dacian conquest, and Liviu noted there is also a replica in the Romanian capital, which I hope to see at some point (side note, Alexandra Ion, I have big plans involving a visit to see you in Bucharest next summer…). In which we learn about the Romans, the Dacians, and covrigei cu brânză. Liviu also expressed his desire to work to make the Roman fortress a heritage site, ideally clearing the vegetation, putting up explanatory signs and placards, and filling in the large circular looter’s pit that dominates the pinnacle of the slope. I think it’s a wonderful idea; as an archaeologist and a tourist I would be drawn to the site because of both its history and the magnificent views it provides of the local landscape. After we’d had our fill of the Roman period, we headed back down the slope and further back in time. One of the reasons I’d been particularly excited about this field trip was that this same area is also home to a series of Early Bronze Age tombs that MARBAL collaborator Horia Ciugudean excavated back in the 1990s. Colin had mapped these out several years ago as part of his dissertation survey, and so we were able to locate them with minimal casting about the landscape. Early Bronze Age tomb (previously excavated), identifiable by the limestone capstones covering the surface of the tumulus. Romanian archaeologist for scale. Most of the tombs had been excavated several decades ago, but we could identify their remnants based on the abundance of limestone capstones, a typical feature of mortuary structures for this period in time. The team standing along the edge of another excavated EBA tomb, further SW along the slope. After we visited the tombs and Professor Quinn gave a brief lecture to the students expounding on their construction/location/regional context/archaeological importance, we headed back down into the woods, aiming for the Calcarele de la Ampoița. As with every Transylvanian I’ve met thus far, both Liviu and Raluca are avid mushroom hunters, so on our way back down we did some impromptu foraging. Raluca examines a potential find. Locally there are two kinds of large yellow mushrooms that look alike, but one is edible and the other is decidedly not. Raluca taught me that you can differentiate between the two because the underside of the inedible mushroom cap will changed colors when you press it with your finger, kind of like that fancy color-changing paper I remember being fascinated by as a grade school student. After hiking back into town, we finished off our day by visiting the institution of Mama Luţă, a local pension that is deservedly famous for its food. After expending so many calories on the hike, I felt it important to sample EVERYTHING Mama Luţă had to offer. This included țuică, a traditional Romanian plum brandy. At Mama Luţă, I learned that there are two kinds of țuică: the ‘sweet’ kind (shown on the right, sweetened with cherries or berries), and the ‘tough’ kind, shown on the left, which is basically high octane moonshine. In order to sample a little bit of everything, I ordered the “Platou Mama Luța”, which came with “telemea, caş, cârnați de casă,şnițel de pui, jumeri, slăninuță, pastramă de porc, ou fiert, ceapă, ardei roşii, castravete“, or in order “ewe’s milk cheese, house sausage, chicken schnitzel, pork cracklings, fatback, pork jerky/sausage, hard-boiled egg, onion, red peppers, and pickles), as well as a side of hearty village bread. We finally finished the meal with sweet plăcinte, served with brânză dulce (sweetened sheep’s cheese) and mere (apples), the latter being my favourite of the dessert offerings. These were all served with sos smâtână dulce (sweetened cream). All in all it was a phenomenal day. Many thanks to Liviu and Raluca for their tour of local Roman period, prehistoric, and culinary institutions! To the surprise of absolutely no one, I’ve just returned to Cambridge from a recent bout of travel, this time to Washington DC for the Society for American Archaeology meetings. This was an unusual conference for me. I’m slowly transitioning from working in one region (Iberia) into conducting research in a new area (Romania). As a result, all of the background material that I rely on having previously prepared to slot into presentations had to be crafted from scratch. Constructing this new backdrop was a useful process, in that it made me delve more deeply into the regional literature, but also meant that putting together my presentations took longer than I am used to. My talk covered our initial research strategy in Transylvania, describing how we’re weaving together evidence from unstudied human skeletal remains in museum collections and new excavations of Early Bronze Age cemeteries in order to better understand how Late Prehistoric communities were organized. This was also the first conference during which I co-authored a poster with a former student. Emilie Cobb, currently director of the Rankin Museum of American Heritage, spent three weeks in Romania with the MARBAL project last summer, helping to conduct a bioarchaeological analysis of human skeletal remains housed at the National Museum of the Union in Alba Iulia. In DC, I also finally threw in the towel and gave in to embracing networking. Over the past few years, I’ve noticed a marked shift in my conference experience. Rather than trying to catch as many sessions as possible, as I did when I first started attending the SAAs in 2013, I’ve been spending far more time catching up with old friends and networking. Especially since I now live in the UK, I’m very deliberate about planning coffees, drinks, or meals with scholars I want to talk to. I outlined these strategies recently in a talk I gave as part of the Biological Anthropology Professionalization Series at Cambridge, which I plan to recap on the blog in the next few weeks. After power-walking for a mile and half on Saturday morning, I arrived at Anna Antoniou‘s talk drenched in perspiration and sat beaming proudly in the back, ignoring the skeptical looks of fellow audience members who were no doubt wondering who had let this sweaty apparition into the conference center. She gave a phenomenal presentation (co-authored with her collaborator Earl Davis), titled”Collaborative Archaeology in Willapa Bay, Washington: Supporting Communities through Scientific Research”. Her talk detailed strategies for building relationships with local native communities and incorporating their interests and concerns into research design. Finally, I swung by the National Geographic sponsored session “The Human Journey: Understanding Human Migration in the Past to Address Challenges for the Future,” specifically to hear a talk given by the youngest presenter, Bree Doering. As a motorcycle-riding, caribou-hunting, and salmon-fishing Alaskan, Bree is one of the most unrepentantly badass field archaeologists I know, and it was wonderful to see her channel her considerable energy into a talk on “Exploring the Cause of the Athabaskan Migration through Isotopic and Geospatial Evidence”. With that, I’m done with conferences until I head to the European Association of Archaeologists meetings in Barcelona in September. In the meantime, if you’d like to read our poster, it’s linked here on Academia.edu, while the abstract of our presentation can be found here. For now, I’ll leave off with this memory of drinking afternoon beers on the lawn with some of my close friends – hopefully it’s enough to get me through this unrelenting spate of spring rains in Cambridge! Last week I put up a post about my paper on the bioarchaeology of Marroquíes, which had recently been published in MENGA: Journal of Andalusian Prehistory. I’m also co-author on a second paper in the volume, titled Stable Isotope Analysis of Human Remains from Los Millares Cemetery (Almería, Spain, C. 3200-2200 Cal BC): Regional Comparisons and Dietary Variability, written with friends and colleagues Anna Waterman, Jonathan Thomas, and Rob Tykot. I’ve known Anna and John since 2010, when I first worked at Bolores, a site excavated by Katina Lillios and a team from the University of Iowa in Torres Vedras, Portugal. Bolores is a Late Neolithic – Copper Age mortuary rock shelter, and is responsible for first sparking my interest in Iberian Late Prehistory. I returned to Bolores for the final field season in 2012, and Anna, John and I have talked about publishing something together ever since. In this high-octane photograph from summer 2012, Anna is wearing a red jumper and looking thoughtful, while I am morosely clutching at my feet for some reason. Photo Credit: Joe Artz. The publication of this new research is particularly exciting as it represents the first dietary isotopic analysis of the people buried at Los Millares*, arguably the most famous site in Copper Age Iberia due to its size, multiple walls, barbican entrance, thirteen hill forts, and extensive cemetery. There hasn’t been a full bioarchaeological analyses conducted for Los Millares, so the stable isotope analyses published here provides an initial glimpse of what life was like for the inhabitants of this village. The isotopes analyzed include δ13Cco, δ13Cap, δ15N, and δ18O (carbon and nitrogen from collagen, and carbon and oxygen from apatite). Figure 1. Map of Iberian Peninsula showing location of Los Millares, from Waterman et al. 2017. Despite the location of Los Millares only 20km away from the Mediterranean Sea, our results suggest that people were largely reliant on terrestrial resources, with limited input of marine foods in their diets. This patterning matches that found at other sites from Late Prehistoric Iberia, potentially reflecting a broadly distributed subsistence strategy that focused heavily on mixed agricultural production, with minor incorporation of wild or aquatic resources. The standard deviations for δ13C and δ15N (at 0.4‰ and 0.6‰ respectively) are larger than those anticipated for homogeneous diets. meaning that plant and protein intake thus likely varied between individuals, with δ13Cap values revealing diversity in carbohydrate resources. The human sample available for analysis was small (n=12),so in the future we hope to analyze wild and domestic faunal remains from Los Millares in order to expand these results and clarify dietary practices in Late Prehistoric Almería. Waterman, Anna, Jess Beck, Jonathan T. Thomas, and Robert H. Tykot. (2017). Stable isotope analysis of human remains from Los Millares (Almeria, Spain, C. 2500-1800 BC): Regional comparisons and dietary variability. MENGA: Journal of Andalusian Prehistory 7(8):15-27. *Note that this link refers to it as a city, but it is more appropriately categorized as a large village. In 2018 I will approach my goals with the predatory enthusiasm of a lion stalking its prey in Nairobi National Park, rather than the sluggish determination of a snail forced to engage in slow-motion acrobatics due to lack of foresight, which is the vibe that has characterized my approach in 2017. The reason that my year has passed in a befuddled haze of airports and train rides is because so much of the academic year has been spent on the road. Though I moved to Pittsburgh in August 2016 for my position as the 2016-2017 Visiting Scholar at the University of Pittsburgh, and technically lived in Pennsylvania through May 2017, I only spent 5.5 months in the city, and spent the other 3.5 months travelling. I travelled for fieldwork, conferences, job interviews, bioarchaeological research, and in order to see friends and visit family. One of my goals for 2018 is thus to limit my travel and stay in one place for at least two months so that I can finally feel a bit settled, and possibly even get some academic work done. That said, I am writing this post from Zanzibar*, on a four-day New Year’s holiday after attending a friend’s wedding in Nairobi, planning to head back to the Cambridge for a week before going to Tübingen and Jena in Germany for six-days on a research trip to meet with collaborators. Even when I seek to avoid it, it seems that travel is determined to find me. The 2017 accomplishment of which I am most proud was co-teaching my first graduate seminar with Liz Arkush, an undertaking that required an unanticipated immersion in Andean archaeology, much cajoling of recalcitrant students who did not want to respond to my thoughtful and stimulating prompts, and, of course, donuts. In mid-winter, I also found out that I had made the grade for a Marie Skłodowska-Curie European Fellowship at the McDonald Institute for Archaeological Research at the University of Cambridge. 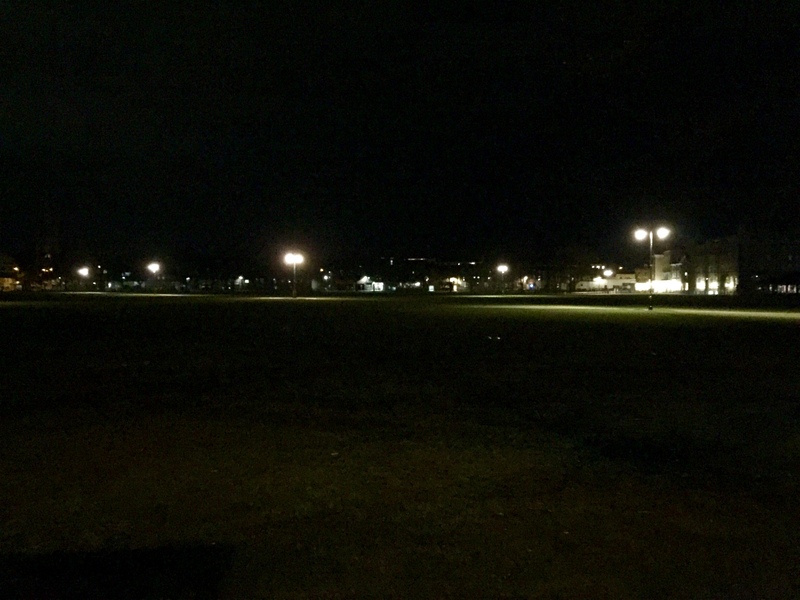 Upon my arrival at the McDonald in October, I realized that I had landed in a wonderfully energetic and welcoming academic community which has 50+ post-docs in archaeology and biological anthropology alone. There are endless and fascinating lecture series that cover everything from contemporary debates in biological anthropology to isotopic analyses of mobility along the Roman-Hun frontier. 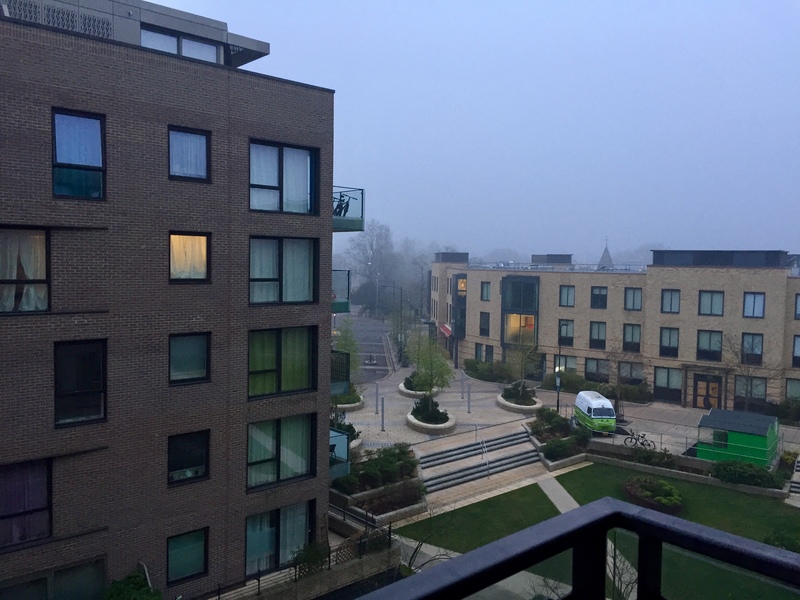 Training and outreach are both components of my fellowship, so in late October I presented my research at the Cambridge Festival of Ideas with new friends and fellow MSCA post-docs Alexandra Ion and Laerke Recht, and in the first week of November I drank Yorkshire Tea for the first time while attending a workshop on entheseal changes at the University of Sheffield. Oh, and as part of my new life in Cambridge, I also finally learned how to ride a bike. At least a fraction of my travel in 2017 was related to conference attendance, beginning with the SAA meetings in Vancouver in early April, where I ate some truly spectacular food, visited the breathtaking UBC Museum of Anthropology, and presented my Iberian research in an eclectic and stimulating mortuary archaeology session. After my brief stint in the Canadian west, I headed to the AAPA meetings in New Orleans in mid-April, where I sampled beignets for the first time and also presented a poster on aging methods for subadult teeth. I closed out the year with a trip back to the U.S. in late November in order to attend my first ever AAA meetings, catching up with a number of old friends while marvelling at the scale of the conference. During all of my time on the road I indeed saw osteology everywhere, starting with some heliconia plants in Bangkok, Thailand. I spent a lot of time in New York State over the spring and summer, and in so doing documented iliac crests at both Storm King art center and in the Mohonk Preserve. During my second foray to my Romanian field site, I witnessed some excellent osteology art, in the midst of bouts of consumption of slanina and Jacobs coffee packets. After moving to the UK, I really did see osteology everywhere: on the London Tube, on Downing Street outside of my institute, and in the fiery coals of Thirsty Riverside’s Winter Garden. I also attempted to share my obsessive osteological attitude by writing Bioarchaeology Vocab posts on both Wolff’s Law and the Standard Anatomical Position. 2017 was an important year for getting my next archaeological project off of the ground. While I went to the field in October 2016 in order to map the site of Ramet, I only spent about 10 days in Transylvania. In July of 2017, I returned with the American component of the MARBAL team (Colin Quinn and Emilie Cobb) to rendezvous with Dr. Horia Ciugudean in Alba Iulia, and analyze a number of human skeletal remains from previously excavated Bronze Age sites in the region. Over the course of the summer we started a new blog, I outlined instructions for analyzing a prehistoric commingled burial, and I recounted a day in the life on the MARBAL project. It has, all in all, been a busy year. I’m already looking forward to seeing where my archaeological peregrinations take me in 2018. In the mean time, a fellow guest at these bungalows wandered by and admonished me “I hope you do not do work! ?”, so it seems like a sign from the universe telling me to take the rest of the year off (six hours and forty-five minutes in this time zone, at least). Wishing a happy and healthy new year to all readers! * Zanzibar is beautiful, which is why I’m posting these photos, but because I’m first and foremost an anthropologist I also strongly encourage everyone to read the first section of Jamaica Kinkaid’s A Small Place when thinking about what it means to be a tourist in a colonial landscape.